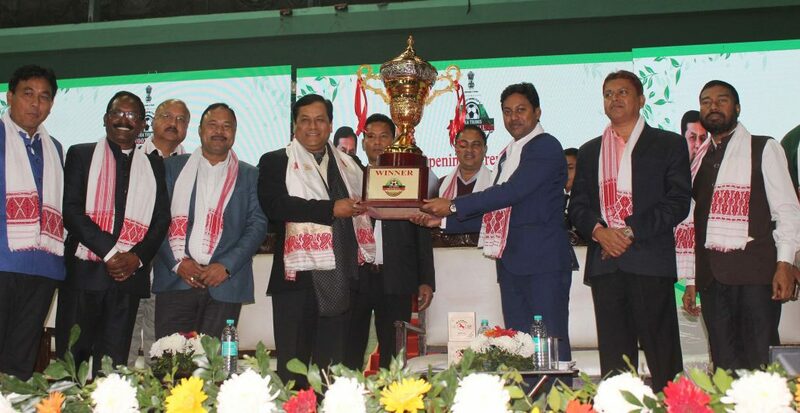 Assam chief minister Sarbananda Sonowal unveiled the trophy for the Chief Minister’s Tea Tribes Football Tournament 2018-19 at a function held at Karmabir Nabin Chandra Bordoloi Indoor Stadium at Sarusaji in Guwahati on Thursday. He also set the ball rolling for the tournament. Speaking on the occasion, chief minister Sonowal said that the tea garden areas of Assam have immense football potentials. If these potentials are given right opportunity using modern technology, they can flourish in national and international sporting events. He also said that sports give an opportunity to give a powerful dimension to life. He said the importance that a nation attaches to sports determines its superiority. Sonowal observed that the countries that performed exceedingly well in sports also excelled in other areas as well. Chief Minister Sonowal said that there is an intrinsic relation between education, culture and sports. He also appealed to all the young players of the state to work hard, excel in the sports and bring glory to the state. Referring to Hima Das who by virtue of her hard work, dedication and discipline has excelled in the national and international events and brought glory to the state, the budding sports persons from the tea garden areas should follow suit to emulate the passion and dedication of Hima Das and work dedicatedly for their vocation. He also urged upon the parents to encourage their wards to take sports seriously. Sonowal also said that his government has decided to set up two playgrounds and an archery academy which would help sporting talents from the tea garden areas to hone their skills in sports. He also said that for the infrastructural development of sports, his government has already released initial payment of Rs eight lakh each to 371 playgrounds. Amount will also be disbursed to the remaining playgrounds under Chief Minister Samagra Grammya Unnayan Yojana. He also said that in the coming days, Chief Minister’s Tea Tribes Football Tournament will be able to create more talents from the tea garden areas and requested the organizers to conduct the game in a disciplined way. Tea Tribes Welfare Minister Pallab Lochan Das while speaking on the occasion gave a brief overview of the government’s steps for nurturing the sports talents from tea garden and rural areas. MP Kamakhya Prasad Tasa also spoke on the occasion. MP Rameswar Teli, MLAs Sanjay Kisan, Terosh Gowala, Bimal Bora, Suren Phukan, Bhaskar Sarma, Member Secretary State Level Advisory Committee for Sports and Youth Welfare Lakhya Knowar, Additional Chief Secretary Tea Tribes Welfare Jishnu Baruah and a host of other dignitaries were present on the occasion.